The upstairs room at the Lewes Arms is great for poetry readings – intimate, so need for a mic, but with a small stage. It’s also pretty quiet, unless the windows are open, in which case there’s inevitably a bit of noise from outside. If there are 30 people there it’s packed. Anyway, the point is we had a super-relaxed Telltale Press & Friends night there on Wednesday, with a full room and attentive audience. Great to see so many poet friends and supporters. The poets reading were Telltales Sarah Barnsley and Robin Houghton, newcomer Rebecca White and special guest Abegail Morley, with Siegfried Baber doing the introductions. Thank you to everyone who came, and see you at the next one – date and venue tbc but probably in the summer – make sure you join our mailing list if you’re not already on it, and we’ll keep you posted. 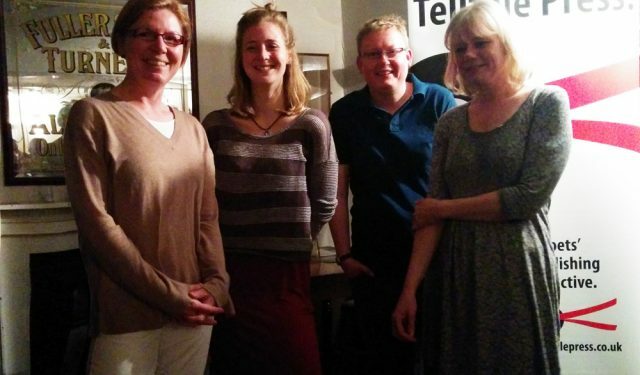 Robin Houghton, Rebecca White, Sarah Barnsley and Abegail Morley after their readings. Spring is almost here, and Telltale Press is at it again. 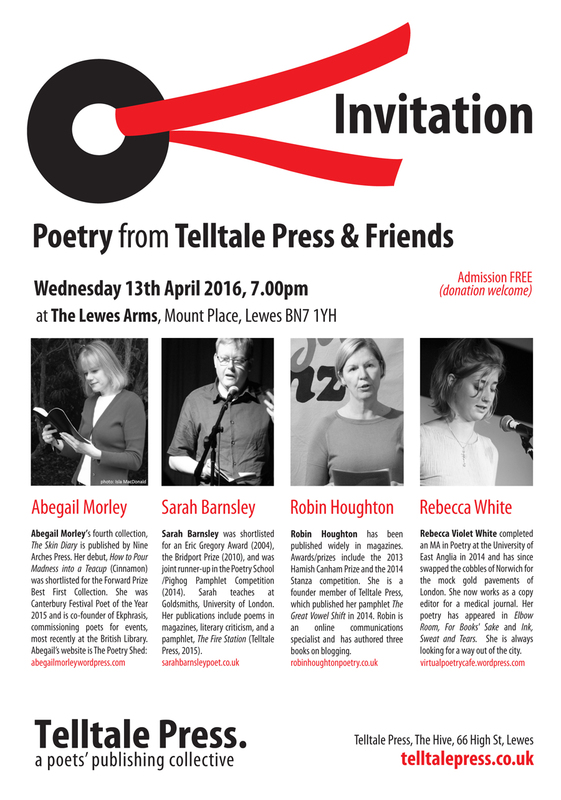 For the second Telltale and Friends event of 2016, we’ll be spellbinding Lewes with powerful lineup of poets. We’ve coaxed the wonderful Abegail Morley (whose new book The Skin Diary is out this year) to read for us. 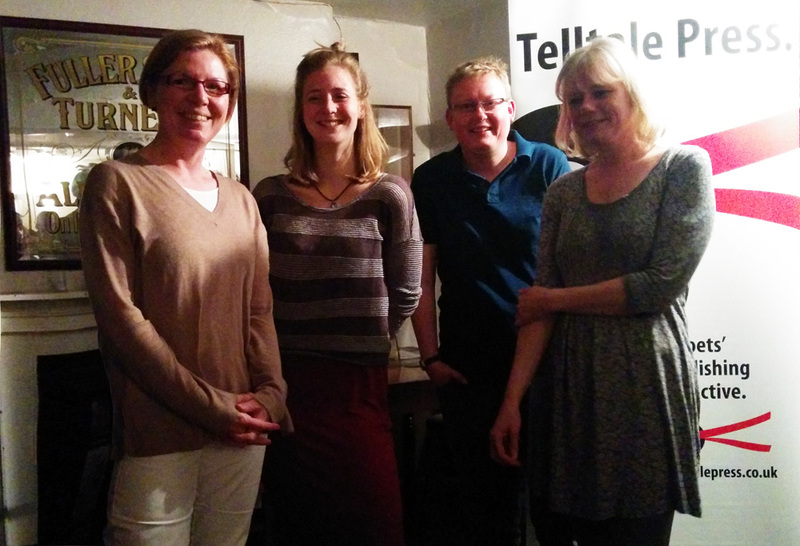 Then we added Telltale’s own stars Sarah Barnsley and Robin Houghton, and invited Rebecca White – a poet whose strong work has been catching our eye lately. The venue is upstairs at the characterful Lewes Arms, a place of fine boozes and warm hospitality. The night starts at 7:00 pm. Can you think of a better way to spend a Wednesday night? Thought not. And, what’s more, the event is absolutely FREE (though if you feel moved to slide voluntary doubloons into the Telltale coffers, we won’t stop you). We’re looking forward to warmly welcoming you to a night of exceptional poetry. Exciting news – we’ve organised our first readings, to launch both Telltale Press and our second Telltale pamphlet, Peter Kenny’s The Nightwork. The first two events are invitation-only. There’ll be lovely refreshments and possibly a few surprises. If you’d like an invitation simply sign up for our newsletter (right hand column) – thanks!